PHOENIX – The Arizona Game and Fish Department (AZGFD) is accepting online applications for 2018 hunt permit-tags issued through the draw process for deer, fall turkey, fall javelina, bighorn sheep, fall bison and pheasant. To apply online, visit https://draw.azgfd.gov/ and scroll down to “Apply for a Draw.” All online applications must be received by the department by 11:59 p.m. (Arizona time) Tuesday, June 12. 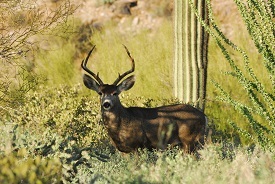 As a reminder, applicants must possess a valid Arizona hunting license to apply online for a hunt permit-tag. That license must be valid on the last day of the online application period (June 12). Licenses are available online and at department offices and license dealers statewide. AZGFD encourages applicants to consider adding “PointGuard” when applying online for a hunt permit-tag. PointGuard ensures if a successful applicant is unable to participate in a hunt for any reason, the accumulated bonus points that were expended to draw that hunt permit-tag will be reinstated. All online applicants must sign up for a free AZGFD portal account to purchase PointGuard (visit https://accounts.azgfd.com/Account/Register). PointGuard is $5 per species, per applicant, purchased at the time of completing the online application or through June 28, which also is the deadline to update credit card or debit card information. For more information about PointGuard, visit https://www.azgfd.com/hunting/pointguard. AZGFD encourages all hunters to open a free portal account. The portal allows customers to create a secure account where they can manage and view their contact information, as well as their license and draw results history and bonus points, in their personal “My AZ Dashboard” section. A portal account is a mobile-friendly, convenient way to access the online license purchase and hunt draw application systems. Another benefit of having a portal account is the opportunity to sign up for the “I Support Wildlife” program, which helps fund wildlife conservation in Arizona. An annual membership for $25 includes access to the “premium” version of the Recreational Access Arizona (RAA) online mapping application, the latest fish stocking reports, an “I Support Wildlife” window decal and a one-year subscription to the award-winning Arizona Wildlife Views magazine. The premium RAA mapping application is a significant upgrade over the free version and is a tremendous tool when planning your hunt. It is designed to work on all mobile devices (with active cell service) and lets you see your current location in reference to different data layers, including Game Management Units, wildlife waters, Arizona land ownership, an ESRI USA Topographic (USGS 24k Topo) basemap and more. Even better, the premium mapping application allows you to create your own point locations and automatically save and sync that data to all of your devices.